Made with the world’s finest premium Saaz hops based on 11 years of Max know-how, this premium beer offers a spicy aroma and rich authentic malt taste. The same ingredients as the Oktoberfest beer (German Noble Hops: Mittelfruh) are used to create an authentic German beer aroma. “Centennial” Hops, one of America’s top 3 hops (3C) known for its “Super Aroma”, is used to create citrus aroma. Oktoberfest beer is a German lager which people drink at the Munich Oktoberfest. It has authentic German malt aroma, rich texture, and clean, fresh taste. Made from the world’s premium SAAZ hops(Czech), it has an herbal, spicy aroma and a rich authentic malt taste that leaves you wanting more. Max Special Hops 2013 is made from Hallertau Mittelfruh (German Noble Hops) to create a fresh citrus and pine aroma with authentic German beer taste. Made with the British hops (Golding, Fuggle, 125 years of history) chosen by the British royal palace, it has authentic aroma and quality. Enjoy the rich tastes of 100% barley with a fresh fruit and floral aroma. Taking up only 0.001% of the world hops production, rakau hops grow in Secret Valley in New Zealand and offers a 100% pure barley aroma and the rich flavor of passion fruit. The Max Special Hops Limited Edition is made from the top quality hops produced in South Africa. It has the rich and authentic aroma of 100% pure barley and the fresh fruit flavor of the subtropics. Max The Premium Edition is made from Buloke malt produced by JWM, a malt producer in Australia with 150 years of experience, and aroma hops produced in Taemanis Island. It offers rich and authentic aroma and taste. The Max Special Hops Limited Edition is made from Nelson Sauvin Hops produced in the clean environment of New Zealand, which takes up only 0.01% of the world hops production, and has a rich floral and fruit aroma. The same ingredients as the Oktoberfest beer (Mittelfruh Hops) are used to create an authentic German beer aroma. “Centennial” Hops, America’s most popular craft hops, is used to create an authentic citrus aroma. Based on 10 years of experience, All New Max has superior quality, creamy head and rich aroma! Oktoberfest beer is a German lager which people drink at the Munich Oktoberfest. Released in 2014, Max Oktoberfest Special Hops is known for its authentic German malt aroma, rich texture, and clean, fresh taste. Released in June, 2014, “CZECH” Special Hops is a Bohemian style pilsner beer with an herbal, spicy aroma and rich authentic malt taste that leaves you wanting more. Released in September, 2013, Max Special Hops 2013 is made from Hallertau Mittelfruh (German Noble Hops) to create a fresh citrus and pine aroma with authentic German beer taste. Renewed in July, 2013, Max has creamy head and an all malt beer aroma, thanks to a perfect balance between the malts and hops. Released in July, 2012, Max Special Hops 2012 has the rich taste of 100% barley with a fresh fruit and floral aroma. Released in July, 2011, Max Special Hops 2011 is made from rakau hops produced in the Secret Valley of New Zealand and offers an authentic and rich aroma. Released in June, 2010, Max Special Hops 2010 is made from the hops produced in South Africa. It has the rich and authentic aroma of 100% pure barley and the fresh fruit flavor of the subtropics. Released in January, 2010, Max The PREMIUM EDITION is made from Australian premium malts and has a rich and authentic aroma. Released in July, 2009, the Max Special Hops Limited Edition is made from Nelson Sauvin and has a rich floral and fruit aroma. “Max” became the fastest growing beer and was recognized as one of the top 3 beer brands in 2008. 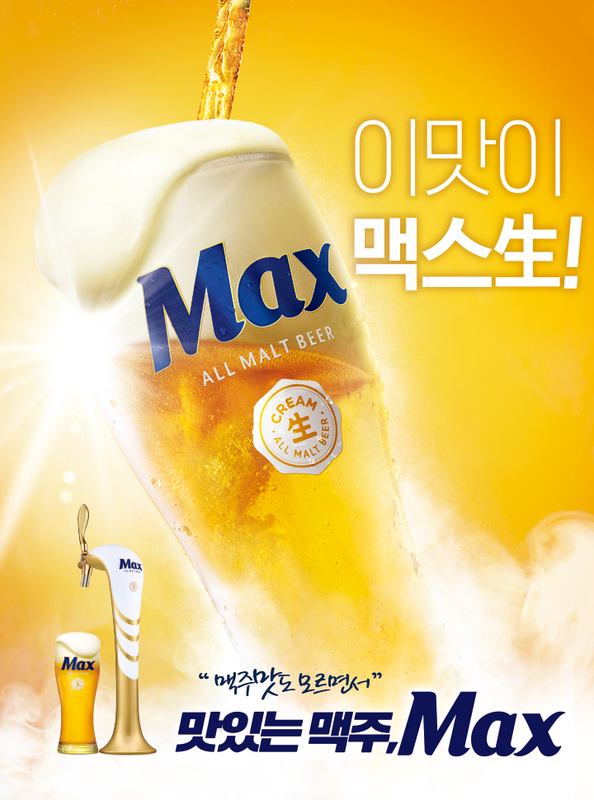 Released in September, 2007, New “Max” is the first All Stainless Korean beer with improved cleanliness and authentic draft aroma. Released in September, 2006, 100% barley beer “Max” has a perfect blend of malt and hops with creamy bubbles for authentic all malt aroma.